Back in Wakanda, the Royal Couple’s troubles continue, as one of T’Challa’s greatest foes makes his power move. In Wakanda the people scramble to find out where Killmonger could have gotten technology to capture Photon. In Niganda Killmonger whips the people in a frenzy as he regales them with tales of unity and overpowering the American invaders. He visits shuri’s cell and leaves some of his army locked in with her to keep her company. She makes short work of them as T’challa and Wakanda attack Killmonger’s forces. They are met with surprising opposition by mutated Animals but T’challa manages to make his way to Killmonger. 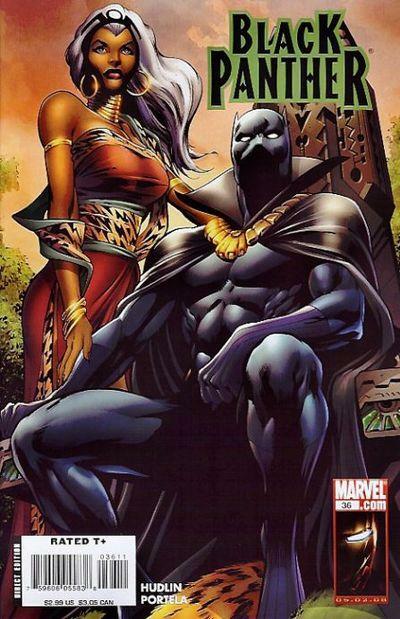 Cover- Sweet illustration of Storm and her Beau, he’s on his throne while she stands beside him in African garb. Ah the happier times of their marriage! How I miss this! Action- Explosions, Bombs, bullets, blood and death. Yup it’s a party…I mean war all right! Art-Cafu continues stellar work which shines in action scenes. Villain- Killmonger is badass and cool too! How awesome is being showered with bullets and having them deflected without a gesture? I’ll tell you! Not as cool as surviving a couple Missiles and one tipped with Vibranium; LoL ; That’s how! 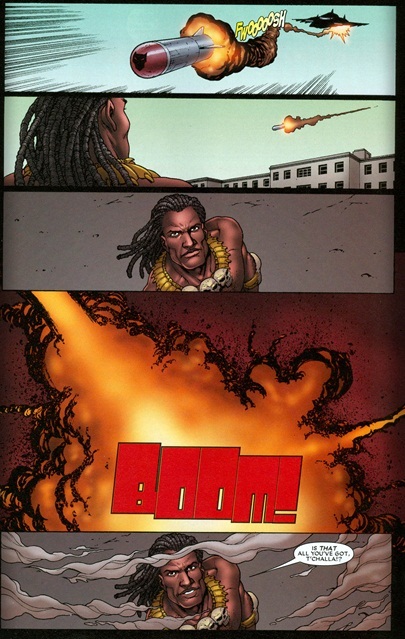 Hudlin ‘s major arc was this story that was tie in from issues 1-6. After this run Jason Aaron and the Skrulls took over. A good read from one of Tchalla’s best story tellers. Ouah I really like the cover, and the dreadlocks of the guy !! Tchalla and Tornade are really my fav ! I think we as black fans of the only image of a strong black couple shouldn’t allow writers to destroy that marriage! I think that Luke cage should be with a black female as well,I would love to see him and Shuri hit off . What if Cage,Falcon,Bishop,Photon and Voodoo all moved to Wakanda and formed marvels first powerful all black team? HUDLIN PLEASE FIX THIS MESS THAT THEY PUT OUR ONE TRUE BLACK HERO IN,YOUR BLACK HEROS ONLY HOPE!